Ideal for all that pocket crap you carry around! A beautiful quality metal tin with a hinged lid and adorned with The Bright Sides unique lettering. A perfect gift, will comfortably fit a whole lifetimes worth of man stuff. I bought this for my other half because he is always emptying his pockets in the bedroom and leaving screws, nails, wrappers etc. around. This tin looks really good as well as being a good size for all his pocket crap. I looked in it the other day and its full of the above mentioned things and his electric razor! 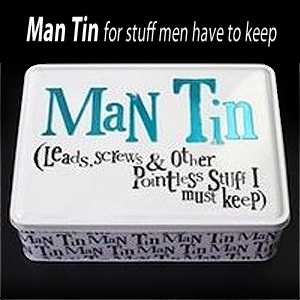 very quirky man tin, for the man who has everything, bought for partner of my daughter who found a sketch by Michael McIntyre about his man drawer hilarious, but also has a practical side too. So drawer tidy, man has special hiding place for useless rubbish, everyone happy Job done. This came quickly and went down brilliantly as a gift for the man you don't know what to buy for . 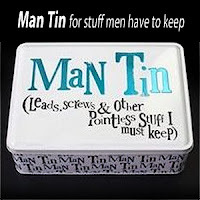 He now has a tin full of things you will never need instead of just a drawer! Lovely little tin, just as pictured. I'm going to give this to my father for Christmas and add some nuts and bolts and a bit of chocolate too.